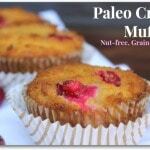 These cranberry paleo muffins are a delicious sweet treat without much sugar...just a touch of honey. 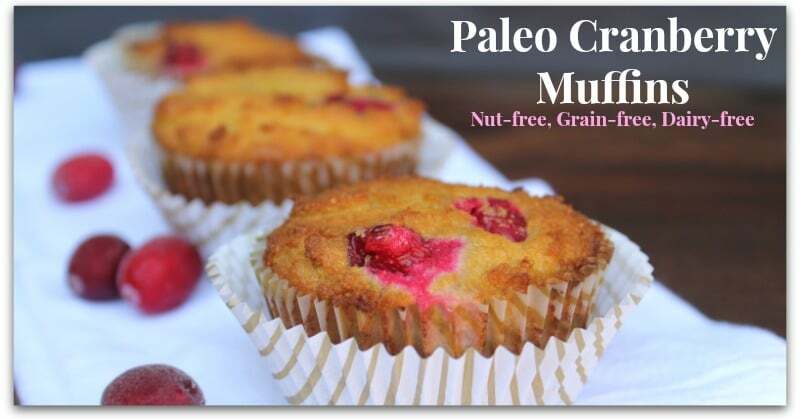 I had some whole cranberries in my freezer that I wasn't quite sure what to do with and I thought making a nice paleo muffin with them would be the perfect thing! 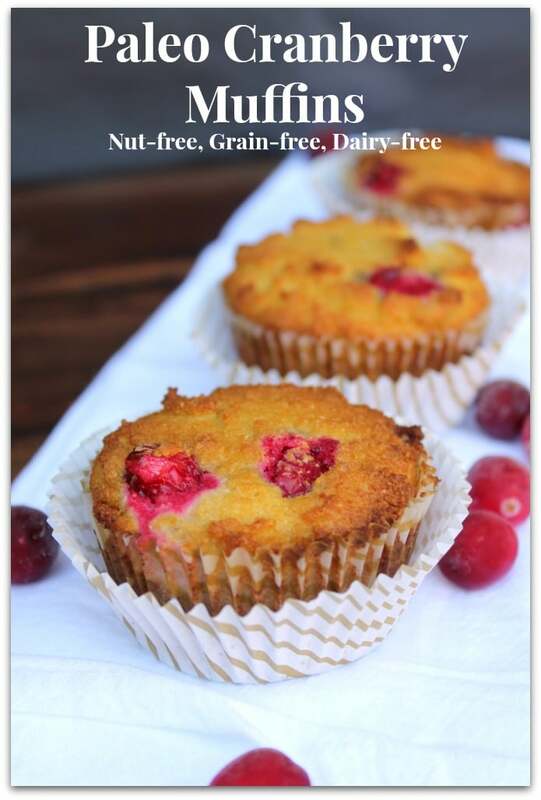 These cranberry paleo muffins are a delicious sweet treat without much sugar…just a touch of honey. I had some whole cranberries in my freezer that I wasn’t quite sure what to do with and I thought making a nice paleo muffin with them would be the perfect thing! These muffins are a favorite that I like to make during the holidays since cranberries are in season in the winter and a popular ingredient for holiday cooking! In fact, they are a perfect addition to the breakfast table for christmas morning. I love that they use only coconut flour which is a great low-carb and high fiber flour. If you want to make this recipe even lower-carb you can try subbing the honey for granulated monk fruit sweetener and adding it a bit more coconut milk to make up for the lost liquid. I have yet to test this out, but I think it would work well! 1/2 cup coconut flour where to buy coconut flour. 4 pastured eggs don't try to sub the eggs, it wont work without them! Pre-heat the oven to 350°. Melt the coconut oil and combine with all the remaining muffin ingredients except the fresh cranberries. Blend in a food processor or bowl, mix until smooth. With a spoon or spatula, gently fold the cranberries into the batter. I used whole frozen cranberries and did not defrost them and it turned out great. Place batter in a muffin tin lined with muffin liners. The muffins will rise a very small amount, so you can fill the muffin liner about 3/4 full–almost to the top. Bake for about 20-30 minutes or until a toothpick inserted comes out clean and the tops are slightly browned and hardened. « Top 15 Lavender Essential Oil Uses! These look AMAZING! My mom used to make this cranberry-orange bread when I was a kid. It had orange juice and orange rind in it, SO good. Do you think the consistency would be the same if I subbed OJ for some or all of the coconut milk? OJ might change the flavor. I would use another milk substitute in place of the coconut milk, like almond milk, hemp milk or regular milk if you aren’t sensitive to dairy. These look amazing! I was curious if pomegranates might work OK? This is what I have on hand at the moment, hmm, perhaps frozen blueberries, I have those too. Thank you for the recipe!! How many muffins does this recipe make? I’d like to try it may but I have a horde of hungry children. ☺ thanks! Coconut flour is very dense so it needs eggs and the substitutes are just not enough. It’s very hard to have a coconut flour recipe with no eggs. You could try looking for an almond flour based recipe since that tends to do better without eggs. Would you happen to know the nutritional value? The’s muffins look delicious, thank you for the great recipes. Why can’t I use dried cranberries? I’ve never tried that. You could try but I’m not sure how it would turn out.